In 1295, Alice de Langley gave herself the title Lady of Bickenhill. 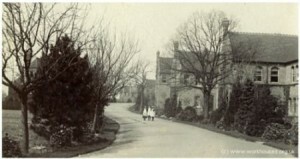 A manor then developed in Bickenhill and by the 15th century, there were two manors. The manors no longer existed by the end of the 16th century. 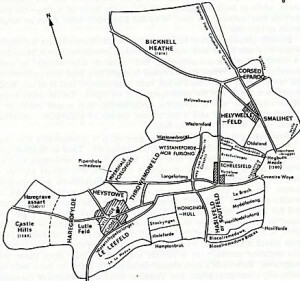 By 1594 the Plague was in Bickenhill and during that year there were 24 burials; 1 in 12 of the population. The area around the church was designated a conservation area in 1977 and most of older houses in the village are Georgian or Victorian. Several older farmhouses survive in the village, with later frontages but with fifteenth century beams remaining internally. 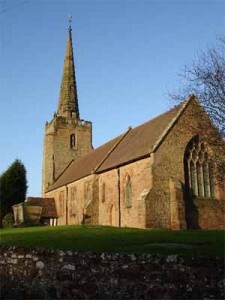 The present Parish Church of St Peter dates from 1140 but little remains of that period. Over the centuries many additions have been made, notably in around 1300 when the chancel was rebuilt, two lancer windows and a ‘leper’ window installed and a priest’s door inserted in its south wall. The church’s spire was struck by lightning in 1876 and rebuilt ten years later at a cost of £400. A huge sum of course in those days. Its most recent addition is the lighting on the tower to warn incoming aircraft of its presence. Marston Green was originally part of the manor of Merestone, which was mentioned in William the Conqueror’s Domesday Book of 1086. A Plaque commemorating this can be viewed in the village library. At this time the village had a population of around 35 people. The predominantly rural area of Merestone existed for many years with little outside influence from town or country. It seems to have been divided in the 12th century into two manors which adopted the name of their lords; Marston Culy after the de Culy family and Wavers Marston after William de Waver who died in 1230. The villages sat alongside each other on a small sandy ridge in the Forest of Arden. The de Culy family first appeared at Marston Culy in about 1248, becoming extinct a century later when the manor passed to Sir Fouk de Birmingham. The Wavers family held the manor of Wavers Marston from the end of the 12th century until 1476. In the fourteen hundreds the Digby family became important land owners in the area, having been granted lands by Henry V11 in the Coleshill area. Over the years the family acquired more land and by the 1600’s much of the land around Marston Green was in their possession. In 1878-9 the pioneering Marston Green Cottage Homes were erected to provide accommodation for pauper children aged from three upwards. This site was one the earliest such developments to be organised as a “village” located away from the workhouse, in an airy rural setting. The original scheme, which opened in January 1880, included seven homes for boys and seven for girls, together with a probationary home, school, infirmary, swimming baths, workshops, bakehouse, a superintendent’s house and offices. A farm was built to the south of the homes. Each cottage was under the care of foster parents and could house around 30 boys or girls, giving accommodation for a total of 420 children. Over the centuries the village grew into a leafy suburb and is now a commuter village with many of its residents travelling into Birmingham and Solihull. 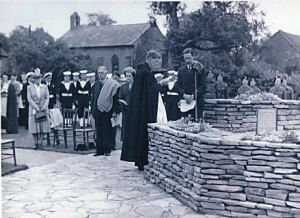 In 1948 a Garden of Memory to the fallen of the two world wars was created on the site of the old gravel pit. The village clock, now a village landmark, was installed in the Garden of Memory in 1998 to commemorate the one hundred year anniversary of the Parish Council. Sir Robert Taylor, then Lord Lieutenant of the West Midlands, and sometime Managing Director of the Birmingham Airport, arranged for the upkeep of the clock to be the responsibility of the airport and this still remains the case today. During the Second World War, a base for the Canadian Air force was built on a site off Coleshill Road. The buildings were subsequently used as a maternity hospital and a psychiatric hospital and were demolished in the 1990’s to make way for a housing estate. Marston Green was part of the Meriden Rural District until 1974, being administered from council offices in Coleshill. It then became part of Solihull Metropolitan Borough Council. The Parish of Bickenhill has seen many changes over the last fifty years. According to the 2001 census, the parish had a population of 6,583 and by 2007 had grown to an estimated 8,000 people. The Parish Council, one of the oldest in the country, serves the village of Bickenhill itself, and the much larger village of Marston Green. Whilst the village centre of Bickenhill has remained largely unchanged, twentieth century life has claimed much of the land between there and Marston Green. 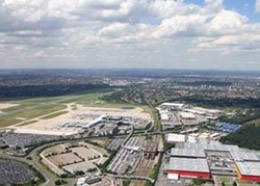 Large parts of the Forest of Arden now include business parks, the National Exhibition Centre, the National Motorcycle Museum, major roads like the M42 and of course Birmingham International Airport. The ancient woodlands close to Marston Green are now housing estates. Old farms have been sacrificed for yet more housing and more business parks. 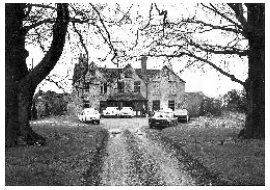 Chapel House Farm, one of the principal farms in the area, Marston Hall and Marston Green Golf Course were demolished in the 1970’s to make way for the expanding airport. At the time of writing, a planning application is pending for a major runway extension and this would necessitate using more of the land between the two villages. Below is an aerial view of the airport with the village in the background, and a photo of Marston Hall which was demolished to make way for the new Airport terminal.